The Front is please to announced the gallery’s six new artist members. You will be able to see their work, alongside the rest of the gallery members’ works, at the upcoming exhibition, Show 26, running June 22 to August 4, with an opening reception on Friday, June 22, from 5 to 8 p.m., at 6 Barre Street in Montpelier, Vt.
Jason Galligan-Baldwin​ / Jason, from Montpelier, bases his work on childhood stories, combining materials from his youth into his printmaking, painting and collage. Learn more about Jason here. Jason Galligan-Baldwin, Exit on Order. Acrylic, collage, serigraph and graphite on panel, 20 x 16 in. 2017​. Kate Burnim / Kate, also based in Montpelier, is primarily a painter whose work spans a wide range of subject matter, but of late, has focused on internal and external landscapes. Learn more about Kate here. Kate Burnim, Track 11. Oil and acrylic on gesso board, 18 x 14 in. 2018. Sam Colt / Sam, another Montpelier-based artist, is an abstract minimalist who uses paint, plaster, ink, gold-leaf, and other materials to create large and small scale works. Learn more about Sam here. Sam Colt, Cassini’s Dive. Grassello, tinted shellac, gold-leaf on masonite, 24 x 42 in. 2017. Mark Lorah / Mark, based in Brookfield, is both a painter and sculptor who creates works that explore frameworks and systems and mutations therein. Learn more about Mark here. Mark Lorah, Untitled. Ink on paper, 50 x 50 in. 2016. 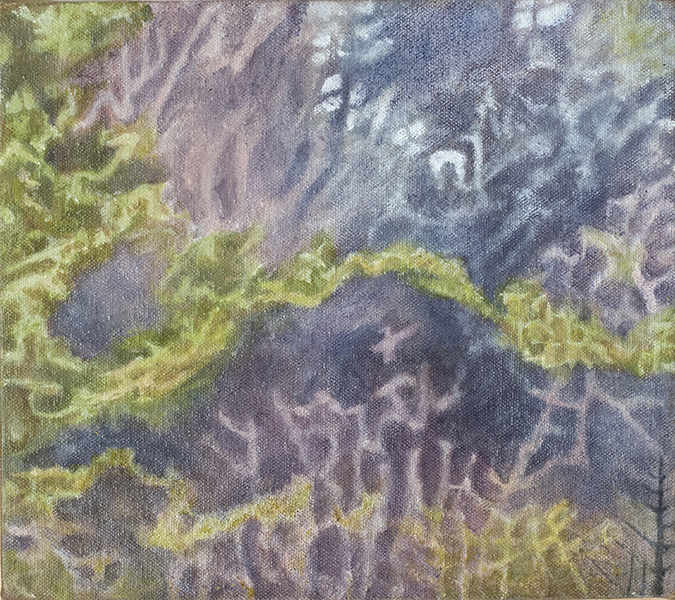 Ned Richardson / Ned, hailing from Moretown, uses a range of techniques and media including digital, watercolor, egg tempera, and oil to observe and explore the relationship between forest networks and human/nonhuman/digital networks. Learn more about Ned here. Ned Richardson, Untitled. Oil and egg tempera on canvas, 9 x 8 in. 2017. Michelle Saffran / Michelle, another Moretown-based artist, uses a photo-based practice to explore the influences of autobiographical memory on identity. Learn more about Michelle here. Michelle Saffran, Majesty of Despair. Photograph, 13 x 38 in. 2018. OPENING RECEPTION: Friday, June 22, 5 to 8 p.m.